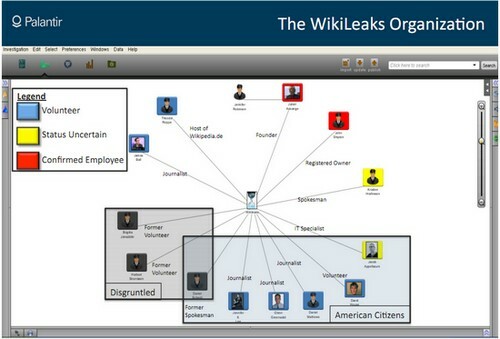 New evidence leaked to the internet by the Anonymous collective seems to indicate that well-connected private security firms were targeting journalists sympathetic to WikiLeaks. This is a troubling sign of events to come as corporations, governments and web collectives such as WikiLeaks and Anonymous engage in continued online combat. A cache of hacked emails from corporate security firm HBGary Federal that targeted Anonymous, strongly implies that they and others were pitching hit pieces on journalist Glenn Greenwald of Salon.com and monitoring James Ball of The Guardian and Jennifer 8. Lee of the New York Times, along with other journalists. The ultimate goal appears to be discrediting the journalists along with WikiLeaks on behalf of Bank of America and the U.S. Chamber of Commerce. (WikiLeaks is presumed to be sitting on a cache of damning documents about BofA.) The bank has denied any connection to HBGary Federal’s alleged plot. Rather it was working with law firm Hunton & Williams, which has represented both the bank and the chamber. HBGary Federal’s computer systems were hacked by Anonymous after the firm publicly announced they were close to unmasking the identities of high-ranking members. Shortly thereafter, members of Anonymous posted a cache of 60,000 emails belonging to HBGary Federal CEO exec Aaron Barr on the popular The Pirate Bay web site as well as Anonleaks.ru. The attacks on the journalists–along with members of Anonymous and WikiLeaks activists–appear to have been planned by HBGary in collaboration with fellow security firms Palantir Technologies and Berico Technologies. Another leaked document from the cache, a PowerPoint presentation titled The WikiLeaks Threat, was prepared by Palantir and is now mirrored on the main wikileaks.ch site. It appears to show that Palantir was monitoring both Ball and Lee, along with journalist Daniel Mathews. A relevant slide from this PowerPoint file is reproduced at the top of this page. 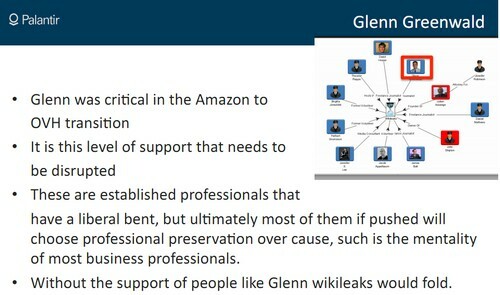 Another slide in the presentation was devoted entirely to Greenwald. Ball has performed extensive data analysis work for WikiLeaks and Lee played a crucial part in disseminating a WikiLeaks video of a U.S. military attack on Iraqi civilians. Given my involvement in this story, I’m going to defer to others in terms of the reporting. But — given the players involved and the facts that continue to emerge — this story is far too significant to allow to die due to lack of attention. Many of the named targets are actively considering commencing civil proceedings (which would entail compulsory discovery) as well as ethical grievances with the relevant Bar associations. […] That this was discovered through a random email hack — and that these firms felt so free to propose these schemes in writing and, at least from what is known, not a single person raised any objection at all — underscores how common this behavior is.